Mossad chief predicts that Israeli teens could be kidnapped. One week later, 3 Israeli teens are kidnapped. Then murdered. Israel accuses Hamas. Hamas denies. Israeli settlers kidnap a Palestinian teen and burn him alive. Hamas responds by launching rockets on Israel. Bombing continues, Palestinian death toll rises. Israeli citizens sit on hilltops to watch Gaza bombing. They cheer and clap at every explosion. Other Israeli citizens post hate messages on social media, calling for Arab genocide. Israeli soldiers do the same. French president issues a statement: “Israel has the right to defend itself.” But doesn’t mention Palestinian victims. ABC News shows gruesome images of death and destruction in Gaza and claim these images are from Israel. Edward Snowden reveals that ISIS self proclaimed Caliph is a Mossad agent. 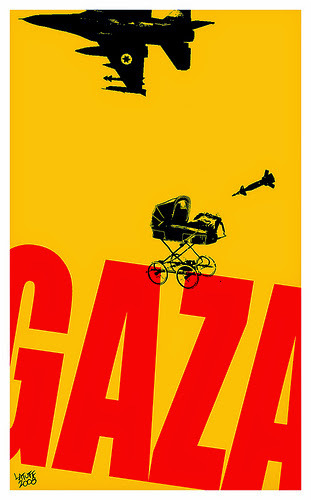 More and more people around the globe, citizen and officials alike condemn Gaza war. Israeli filmmakers stop Jerusalem Film Festival to take a stand against war. UK MPs, Conservative, Labor and Lib-Dem alike denounce Israeli war crimes. UN condemns use of WMD by Israeli army against civilian population. Knowing Hamas will reject it, Israel agrees. In Paris, pro-Palestinian demonstration falls into a trap set by police and Jewish extremists. French government and media talk of anti-Semitism. World press witnesses the killing of 4 Palestinians kids playing football on a beach by Israeli bombing. French TV crew records the scene. The video of the massacre goes viral. French president declares: “Israel has the right to defend itself.” And bans further pro-Palestinian demonstrations. CNN journalist is sacked after tweeting her disgust of Israelis citizens sitting on hilltops and cheering Gaza bombing. Demonstrations in Israel and Europe against Gaza war. Chile suspends trade relations with Israel. Ecuador withdraws ambassador from Tel-Aviv. Israeli ground invasion and bombing continues. Palestinian death toll so far: 500 dead.